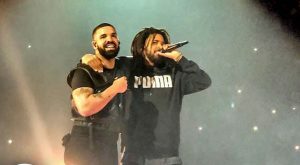 Drake and J. Cole got a chance to reunite at Drake’s Assassination Vacation Tour in Europe on Thursday (April 11),and while there, they also revealed plans to cook up some new music. In the video captured by a fan at the show, Drake praised Cole for his artistry and expressed his eagerness to work with him. “I can’t wait to make some new music with you, I know we have been working, I can’t wait…,” he said much to the crowd’s delight.